Click on the alarm clock to shut it off. Get out of bed and go to the kitchen. There’s a wallet on the kitchen table. Pick it up. Take the cash and look at the card about the Lunda Wheel. Find your way to the living room. Carol’s mobile phone is on a charger on the floor in a corner of the room. Stina's kiosk appears on the map. Carol's mobile phone is added to the inventory. Find Carol’s computer/TV room. Pick up the lipstick beside the computer monitor, and find out that it’s actually a ballpoint pen, which is added to the inventory. Pick up the ballpoint pen refill beside the doll’s house. In inventory combine the ballpoint pen refill with the ballpoint pen, and get a recently refilled ballpoint pen. Pick up the keys in the allotment from the flower basket. Use the keys to open the blue shed, and grab the hacksaw on the left wall. Look at the notice stuck on Stina’s kiosk. Carol says ”Accident? I must go to Stina at once.” Stina's home appears on the map. Carry out the conversation with Stina. Stina’s attic appears on the map. Find room 8 at the end of the corridor. Take the toilet bowl in the same room. Place the toilet bowl beneath the banana box to reach it. Pick up the strange photo and the medical license from the banana box. Look at the lower right corner of the license and see that the license was issued by the Norrköping Board of Medicine”, which appears on the map. There is also a metal box with numbers on in the banana box. It cannot be opened at this stage. Talk to the clerk at the desk. When the clerk turns to the computer, pick up the list on his desk. Use the pen on the list and add Carol’s name. A new question comes up, and the clerk will allow you to enter the archives. Look at the door with the code lock. It can’t be opened yet. Proceed forward and find the blue tin box. Look at it in close-up and pick up a desk key from it. A jacket hangs to the left of the shelf with the blue tin box. Walk to the other side of the room to reach the right pocket of the jacket. Search the pocket and find a drawing of 4 hands. Find a grey metal door which leads to another room. Examine the desks at the right side of the room. One desk contains some sticky stuff. Pick it up. At the end of the room you will find a locked desk. Open it with the key from the blue tin box. 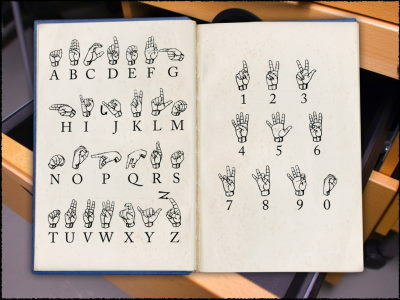 Pick up the sign language book. The door with the code lock can now be opened. The code is 2567. We are now inside the actual archives. Read the paper inside the green map on the table. There is a sheet of paper stuck between the box files on the shelf by the wall. Look at it. 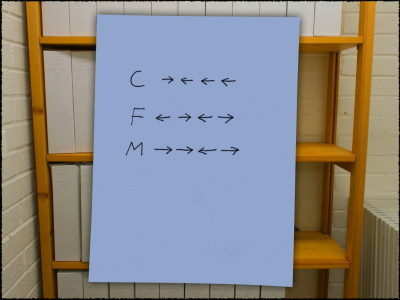 It has arrows relating to the letters C,F and M.
We can now open section M, using the information from the green map and the blue sheet of paper. You need to turn the handle twice to the right, then once to the left, and finally once again to the right. Find box file 0460 and read what’s in it. Exit the archives and engage in a new conversation with the clerk. The library appears on the map. Look at the right shelf and find a book about the Broxtowe Psychiatric Institution for the Criminally Insane. The John Milius Exhibition appears on the map. Look at the phone in the inventor and click on the phone number. Henry Milius appears on the map. Talk to Henry Milius, and get the key to the exhibition. You can now enter the exhibition with the key Henry Milius gave Carol. Read the text about Julian Milius on the green pedestal. Look at the painting of a bird on the wall and read the text. Examine the calendar on the same wall and read the text below it. Look at the article about The Broxtowe Psychiatric Institution for the Criminally Insane. The Broxtow Psychiatric Institution appears on the map. Return to Stina’s attic and punch in the numbers 06/06/35 on the metal box which is in the banana box. Pick up the “Famous Swedish Criminals” collectors' card with featuring Alfons Larson. Read the considerably newer article that is under it. The Miranda Hospital is now merely a ruin, almost entirely hidden behind trees. Go to the very end of the interior of the hospital, and find a tile on the right. The first windmill and the second windmill appear on the map. Open the door to the windmill. Look up through the opening leading to the second floor. Carol comments: ”So how do I get up there?”. Pick up the orange box (box with useless stuff) on the left. Place the orange box on the red box and climb on it to reach the second floor. The ladder on the second floor leads to another floor. Climb the ladder. As soon as you reach the next floor look closely at the floor in front of you. Pick up the loop bolt. Enter the windmill and climb the ladder. Go to the inner half of the top floor, turn around 180 degrees and look up. Below the enormous brake wheel there is a small red pouch of some kind. Use the loop bolt to get the pouch. The pouch contains a rusty key to the Eastern windmill. There is a bird’s nest on the floor. Pick up the ring from it. Read the text displayed on the monitor from the diskette. The Eastern windmill appears on the map. The door to the Eastern windmill is locked. Use the key to open it. Immediately look to the left after having entered the windmill. Pick up the sketch from the wooden container. Take the message to Julian under the sofa. Read it, and the Post-It note attached to it. Go back to Henry Milius and talk to him again. Henry Milius Store Room appears on the map. There is a flashlight standing on a box slightly to the right of the middle of the frame when you first enter the room. Pick it up. Pick up an envelope from the checkered pot. Read the letter from the doctor, and the article about Polio. Lift the photo standing to the left of the pot. Walk past the front of the institution and turn to the right. Look up at the wall and see the gratings. Note the gear icon below the window. Leave the area. You get an SMS from Jonas: SOS! Can you meet me at the Craftsmen’s Café? The Craftmen’s Café appears on the map. The Linnea Shore appears on the map. The Lunda Wheel appears on the map. (If the Lunda Wheel doesn’t appear on the map here, you have to go back to Carol’s home and look at the card in the wallet to get the address). Go to the very end of the area. You’ll find a dark opening in the mountain. Use the flashlight and pick up the key. Look beneath the stairs and find a hacksaw blade. In inventory combine the hacksaw blade with the hacksaw and get a hacksaw with blade. Open the door and pick up the ladder inside the small room. Walk pass the front of the institution, turn to the right and place the ladder under the window. Use the hacksaw with blade to saw the grating open. Enter through the window and you will find yourself inside on the building’s first floor. Go forward five times and turn left. From here you can enter the yard. A bicycle pump lies to the left of the gazebo. Pick it up. Go back inside the building. From the same place that you entered the yard you can also use the stairs to get to the second floor. While on the second floor turn right, walk forward five times and turn right again. Look at the floor in the blue cell in close-up. Pick up the round key. Turn right, walk forwards once and turn right again. Use the round key to open the towel dispenser. Pick up the tube-shaped thing inside the dispenser. Turn around to see a bathtub. Pick up the hammer and nails from the bathtub. Compare the coded message from Broxtowe with the coded part of the message from Alfons to Julian from the Eastern windmill. The signs on the coded message from Broxtowe seems to read “four right, two left, four right”. Lift the green box standing to the right of the checkered pot. Turn the compass according to the coded message: “four right, two left, four right”. Talk to Henry Milius again. The Boat Graveyard appears on the map. Go back to the allotment and pick up the rubber boat from the blue shed. In inventory, combine the rubber boat with the bicycle pump to get an inflated rubber boat. Use the tile from inventory to row the boat. Use the ladder to get to the upper deck. Go left and then through a door to get inside the ship. There is a staircase leading down. Pick up the crowbar that lies at the top of the staircase. You’ll find a bar near the center of the deck. Walk past it and look to the right. Pick up the clippers that are on the small shelf. Go back to the hatch at the front of the boat. Open it with the crowbar. Take the GPS receiver and the piece of cardboard. Place the piece of cardboard on the painting with the multicoloured quarter circles. Rotate it until 4 coloured symbols fit the holes in the cardboard. The colours are green, black, red, and blue. Climb through a window in order to reach the interior of the ship.. Carry on forwards and go through two doors. There is a safe to the left in the flooded room behind the second door. It has a circle on it in 4 colours. Press on the colours in the same order as you saw the symbols through the holes of the cardboard: i.e. green, black, red, and blue. Someone attacks Carol from behind! Look behind the stone and pick up the magnetic stripe card. Use the clippers to cut the steel wire holding the large matchbox on the second floor. Look at the contents of the matchbox. There is a book entitled ”From Bones to Stones - Brief descriptions of local tourist attractions” on the left shelf. Take it down and read it. The Loredum Stones appears on the map. Examine the stones carefully. Notice that the shapes of some stones are identical to the ones on the sketch from the Eastern windmill. To the right of the entrance of the area, you will find a wooden ladder leading over the fence. Pick up the two planks that have fallen off the ladder. Go back to the Eastern windmill and mend the ladder on the second floor using either the planks or alternatively the hammer and nails – from inventory. If Carol says ”I think I need something else too.” you have missed picking up either the hammer and nails from Broxtowe, or the planks from the Loredum Stones area. Climb the ladder to get to the top floor. As soon as you get to the top floor you see some symbols on the wall and a nail above them. Look at it in close-up, and hang the transparent film from inventory on the nail. Turn around to where the ladder leads down. Pick up the piece of paper on the floor. It’s an advertisement from a call-girl. Flip the advertisement. Sundown Road 42 C, 1st floor appears on the map. Compare the placement of the stones on the sketch with the corresponding numbers on the transparent film from the upper floor of the Eastern windmill. They are a2, b3, b6 and b4. Ring the doorbell and then turn to the right. Enter the apartment. Find the closet in the hallway. Go to end of the living room and pick up the dog food. Go back to the closet and place the dog food under the shelf with the box. Place the tile on top of the dog food and stand on it. When the different coloured areas on the box are pressed, they produce a letter in the round area in the middle. 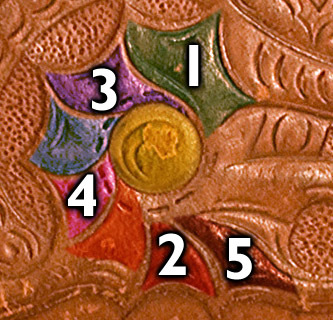 Press the areas in the following order: Green (first from top), red (second from bottom), purple (second from top), pink (fourth from top), brown (first from bottom). There is a matchbox in the upper left corner of the box. Open it and look at the piece of paper inside it. The cabin at Rawberry Road appears on the map. Knock on the front door. No one opens it. Find the window leading to the basement on the right side of the house. Open it and jump down. Turn left and enter the room in front of you. Turn around 180 degrees. Enter the house via the stairway. Turn right and go forward to enter the kitchen. Go to the second floor. Enter the bedroom with two unmade beds. Look in the chest beside the door in the bedroom. Lift the photo and turn it around. Pick up the photo of Amber. Enter the other room on the second floor. Find the ladder leading to the loft and climb it. Go to the end of the loft and turn around. Pick up the key from the floor. Go down the ladder. Use the key from the loft on the light beige cabinet beside the exit door. Find the notepad in the cabinet and read the unfinished letter. Go down the stairs to the dining room. Look at the program on the chest. Note the colours on the flag for the “Hot Oxes”. In inventory, combine the GPS receiver with the old charger to get a GPS receiver with charger. Plug the GPS receiver with charger in the wall socket in the living room close to the window. Wait a while and pick up the GPS receiver. Press on the buttons on the GPS receiver twice. Carol says: ”Let’s see...”. Amber's apartment appears on the map. ”Talk” (she lost a bet and may only write) to the young woman. When she asks you for an invitation you can answer “Oh yes, it’s right here” if you’ve picked up the photo of Amber in Amber’s clients' apartment. If not, you have to go back to Amber’s clients' apartment to get the photo. When Amber asks you what you can do for her, give her the ring. If you don’t have the ring, you have to go back to the second windmill to get it. Go back and talk to Bigge again. You are automatically transported to his apartment. Go behind the green drapery in the hallway and turn immediately right. Grab the painting of the Loredum Stones and turn it around. Knoel Street 24b appears on the map. Go forward 5 times and then turn to the left. Enter the 24 hour yard sale. Find a hockey stick on sale. Take the hockey stick. Pay for the hockey stick in the small basket on the yellow table using the cash from inventory. Leave the yard sale and find the opening in the fence at the other side of the road. Carol finds Knoel Street 24a. The house beside it is gone, and Carol exclaims: ”So, Knoel Street 24b was obviously here”. Go to the other side of the house and turn around the corner. Look through the broken window. In inventory, combine the hockey stick with the sticky stuff to get a sticky hockey stick. Use the sticky hockey stick to obtain the paper which is inside the building. The Electro Junk Workshop appears on the map. Use the magnetic stripe card from the boat graveyard to open the door. Inside the workshop turn left, and open the small cup in front of you. Pick up the carpet knife and read the article and the letters. Turn around 180 degrees and take the key from under the loudspeaker. Enter the inner room and open the cupboard with the key from under the loudspeaker. Open the metal box and take the pistol. Pick up the jiffy bag and open it with the carpet knife. Close the cupboard and turn to the right. Carol is now automatically transported to her apartment. She puts down the clock on a table in her computer/TV room. The stones we have seen on the sketch correspond to the codes b2, a3, b6 and b4. According to the note with codes from the electro junk workshop, they correspond to the following hours of the day: 11, 5, 10, and 9. Open the clock by turning the hands to 11 o’clock, 5 o’clock, 10 o’clock, and 9 o’clock. If the clock doesn’t open, you haven’t opened the jiffy bag in the electro junk workshop and/or placed the transparent film on the nail on the upper floor of the Eastern windmill. Read the message inside the clock. The Broby Sanitarium appears on the map. Go to the very end of the area to find the annexe. Enter the annexe through the door on the short side. Go forward 5 times, and turn left. Open the door. Look at the right side of the desk in close-up. Take the pliers. Close the door, turn left, walk forward twice, and then turn left again. Turn the key with the pliers. The door opens. Look at the small white envelope on the shelf in the green room. Pick it up and open it. Take the key from the envelope. Enter Broxtowe again. Go upstairs by going forward 5 times, turn left, and use the stairs. Turn right, go forward twice, and then turn left. Try to open the metal door. It’s locked. Use the key from Broby to open the metal door. Carol enters the burnt-down attic. She says: ”I need some protection before going up here.”, and doesn’t want to proceed. Take the helmet lying in from of Jonas. Turn right immediately, and pick up the screwdriver lying on the ground. Proceed further into the attic until you find a dark room. Use the flashlight to light up the dark room. Look at the locked chest in the room. Walk forward once, turn left, forward, and left again. Look at the towel dispenser in close-up. Use the towel dispenser key to open it. Remove the towel dispenser with the screwdriver. Enter Broxtowe again. Go forward 4 times, turn left, go forward, and turn left. Look at the lamp hanging down from the ceiling. Remove the cover from the lamp. Take the key inside the lamp. Turn left, walk forward once, turn left, walk forward once, and turn left again. Use the stairs. Turn right, go forward twice, and then turn left. Open the metal door. Go to the end of the attic. Open the chest with the key from the lamp. Lift the right-hand banana box. Take the envelope with the formula. Before you get out of the building, Carol gets an SMS. "I think you've missed something". Go to the very end of the interior of the hospital. Turn around, and David Larson will turn up in front of you. When he starts telling Carol to get down on her knees, look up at the brick wall. Take the gun from inventory and shoot at the wall. Click on the forward arrow to escape from the vicinity. Read the letter that Carol has written to Stina. It explains the whole series of events. Read the epilogue which describes what happens to the characters after the mystery has been cleared up. CONGRATULATIONS ON COMPLETING AMBER'S BLOOD!